League of Women Voters®of Central New Mexico Inc. The name of this organization shall be the League of Women Voters® of Central New Mexico, Inc., hereinafter referred to in these Bylaws as the LWVCNM. 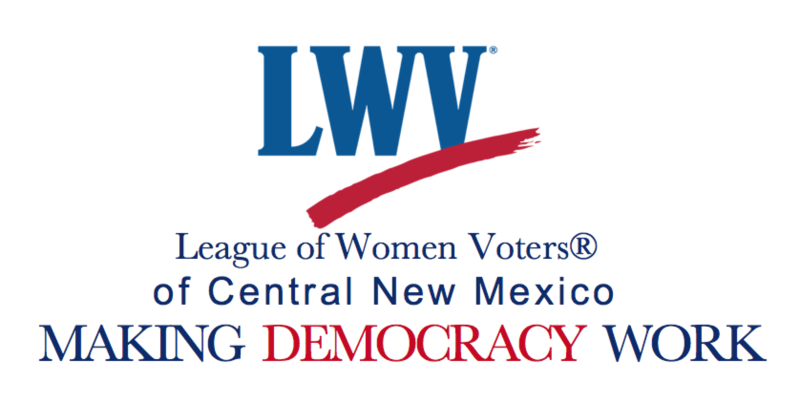 This local League is an integral part of League of Women Voters® of the United States (“LWVUS”) and of the League of Women Voters® of New Mexico (“LWVNM”). Purpose. The LWVCNM is organized and operated exclusively for charitable purposes under Section 501(c)(3) of the Internal Revenue Code, or the corresponding section of any future federal tax code. Notwithstanding any other provision of these Bylaws, the LWVCNM shall not carry on any other activities not permitted to be carried on by a corporation exempt from Federal Income Tax under such provisions of the Internal Revenue Code. No substantial part of the activities of the LWVCNM shall be attempting to influence legislation. Political Policy. The LWVCNM shall promote political responsibility through informed and active participation in government and to act on selected governmental issues. The LWVCNM shall not support or oppose any political party or candidate.Membership. Eligibility. Any person who subscribes to the purposes and policy of the LWVUS shall be eligible for membership in the LWVCNM. Types of membership. The membership of the LWVCNM shall be composed of voting members and associate members. Voting Members. Persons at least 16 years of age who join the LWVCNM shall also be voting members of the LWVNM and of the LWVUS. Associate Members. All others who join the LWVCNM shall be associate members. Number, Manner of Selection and Term of Office. The Board of Directors shall consist of the officers of the LWVCNM, six (6) elected directors and not more than six (6) appointed directors. Three (3) directors shall be elected by the general membership at each LWVCNM Annual Meeting and shall serve for a term of two years, or until their successors have been elected. The elected members shall point such additional directors, not exceeding six (6), as they deem necessary to carry on the work of the LWVCNM. The terms of office of the appointed directors shall be one year and shall expire at the conclusion of the next LWVCNM Annual Meeting. Elected officers and directors may serve a maximum of two consecutive terms in a given capacity, but may be reelected in another position. Qualifications. No person shall be elected or appointed or shall continue to serve as an officer or director of the LWVCNM who is not a voting member of the LWVCNM. Vacancies. Any vacancy, other than in the office of President, occurring in the Board of Directors by reason of resignation, death or disqualification may be filled, until the expiration of the term, by a majority vote of the remaining members of the Board of Directors. Disqualification may occur in the event that any member of the Board of Directors becomes unable or unwilling to perform the duties set forth in Article VI below, or as otherwise have been properly directed by the Board. Such members may be deemed disqualified to hold office by a two-thirds majority vote of the Board of Directors. Three consecutive absences from a Board meeting of any member without a reason acceptable to the Board of Directors shall be deemed a resignation. Powers and Duties. The Board of Directors shall have full charge of the property and business of the LWVCNM, with full power and authority to manage and conduct same, subject to the instructions of the general membership. It shall plan and direct the work necessary to carry out the program adopted by the National LWVUS Convention, the State LWVNM Convention and the LWVCNM Annual Meeting. The Board shall create and designate such special committees as it may deem necessary. Meetings. There shall be at least nine regular meetings of the Board of Directors annually. The President or a Co-President may call special meetings of the Board of Directors and shall call a meeting upon the written request of five (5) members of the Board. When necessary for the timely conducting of business, a polling of the Board of Directors by telephone or email, at the direction of the President or a Co-President, shall constitute a special meeting of the Board of Directors. Quorum. A majority of the members of the Board of Directors currently serving shall constitute a quorum. An executive committee, consisting of the President and three other members of the Board of Directors appointed by the Board of Directors, shall act for the Board of Directors between regular meetings, provided that any action taken shall be presented to the Board of Directors for ratification at its next meeting. Three members of the executive committee shall constitute a quorum to transact business. Enumeration and Election of Officers. The officers of the LWVCNM shall be a President or Co-Presidents, a First Vice-President, a Second Vice-President, a Third Vice-President, a Fourth Vice-President, a Secretary, and a Treasurer who shall be elected for terms of two years by the general members at the LWVCNM Annual Meeting and take office immediately. The President or Co-Presidents, the First Vice-President, the Fourth Vice-President and the Secretary shall be elected in odd-numbered years. The Second Vice- President, the Third Vice-President and the Treasurer shall be elected in even-numbered years. The President or Co-Presidents. The office of President may be held by Co-Presidents. The President or a Co-President shall preside at all meetings of the LWVCNM and the Board of Directors. The President or a Co-President may, in the absence or disability of the Treasurer, sign or endorse checks, drafts and notes. The President or Co-Presidents shall be ex-officio, a member of all committees except the Nominating Committee. The President or Co-Presidents shall have such powers of supervision and management as may pertain to the office of the President and perform such other duties as may be designated by the Board. The Secretary. The Secretary shall keep minutes of the LWVCNM Annual Meeting and of all meetings of the Board of Directors. The Secretary shall notify all officers and directors of their election. The Secretary shall sign, with the President or a Co-President, all contracts and other instruments when so authorized by the Board and shall perform such other functions as may be incident to the office and shall perform such other duties as the President or Co-Presidents and Board may designate. The Treasurer. The Treasurer shall collect and receive all monies due; the Treasurer shall be the custodian of these monies, shall deposit them in a bank designated by the Board of Directors and shall disburse the same only upon the order of the Board. The Treasurer shall present written financial reports to the Board at its regular meetings and a written Treasurer’s report at the LWVCNM Annual Meeting. The Treasurer shall perform such other duties as the President or Co-Presidents and Board may designate. The books of the Treasurer shall be reviewed annually, at the end of the fiscal year or at the time that the Treasurer leaves office, whichever occurs first, by a Financial Review Committee of at least two (2) LWVCNM members, a least one of whom is a member of the Board of Directors, or an accountant appointed by the Board of Directors. The Leadership Team. When a President is not elected and the Vice-President is unable to assume the responsibilities of the President, the Board of Directors shall govern the organization as a leadership team. At the first Board of Directors meeting following the annual meeting, officers and directors that were elected to serve on the Board of Directors will volunteer, self-select or be nominated to accept the leadership position(s) of President or Vice-President. Two or more individuals may serve in this capacity (Co-President, Co-Vice-President). The leadership team will identify the responsibilities of each member of the team, and have responsibility for the routine business of the LWVCNM (e.g., calling meetings, preparing agendas, chairing meetings). The Board of Directors also recommends the addition of an Executive Committee to conduct pressing business which needs addressing before the next board meeting. Fiscal Year. The fiscal year of the LWVCNM shall commence on the first day of May in each year. Dues. Annual dues shall be determined at each LWVCNM Annual Meeting by a three-fifths (3/5) vote of those present and voting. Dues shall be payable on the first day of October of each year. Any member who fails to pay dues within two (2) months after they become payable shall be dropped from the membership rolls. When two or more members reside at the same address in a common household, the annual dues payment determined at the LWVCNM Annual Meeting shall be paid by the first member. Dues equal to one half of the said annual dues payment will be paid by each additional member in that household. Any member who becomes a paid life member or a life member under the terms of the bylaws of the LWVUS shall be excused from the payment of annual dues to LWVCNM. If authorized by the LWVUS Board, student memberships shall be available at a reduced rate for individuals attending high school, vocational school, or college at least half time. The LWVCNM Board shall set the dollar payment. Budget. A budget for the ensuing two (2) fiscal years shall be submitted by the Board of Directors at the LWVCNM Annual Meeting for adoption on even-numbered years. The .budget will be reviewed and adjusted at the Annual Meeting on odd-numbered years. The budget shall include support for the work of the LWVCNM as a whole. Budget Committee. A Budget Committee shall be appointed by the Board of Directors at least three months prior to the LWVCNM Annual Meeting to prepare a budget for the ensuing fiscal year on even-numbered years. The budget will be reviewed and adjusted at the LWVCNM Annual Meeting on odd-numbered years. The Treasurer shall be an ex-officio member of the Budget Committee. The proposed budget shall be sent to all members one month prior to the LWVCNM Annual Meeting. Transfers of Property. Subject to Board approval, any two of the following officers, the President, or a Co-President, the Vice-Presidents and the Secretary or Treasurer, shall have the authority to assign, endorse transfer, and deliver, in the name and on behalf of the LWVCNM, any certificate of stock, bond, note, or other property belonging to the LWVCNM. The Secretary or Treasurer shall have the authority to affix and attest the seal of the LWVCNM to any agreement, assignment or other document executed by any officer of the LWVCNM pursuant to authority granted by these Bylaws or by action of the Board of Directors. Distribution of Funds on Dissolution. In the event of dissolution for any cause of the LWVCNM, all monies and securities or other property of whatsoever nature which may at the time be owned by or under the absolute control of the LWVCNM shall be distributed at the discretion of the Board of Directors, or such other persons as shall be charged by law with the liquidation or winding up of the LWVCNM and its affairs, to any member organization of the League of Women Voters® national organization which is exempt under Section 501(c)(3) of the Internal Revenue Code or the corresponding section of any future federal tax code; or if none of these organizations are then in existence or exempt under the tax provisions, then, at the discretion of the Board of Directors, to another organization which is organized and operated exclusively for charitable and educational purposes and which has established its tax-exempt status under such designated tax provisions. General Membership Meetings. There shall be at least four (4) meetings of the LWVCNM general membership each year. Time and place shall be determined by the Board of Directors. LWVCNM Annual Meeting. The LWVCNM Annual Meeting shall be held between April first and May fifteenth, the exact date to be determined by the Board of Directors. The LWVCNM Annual Meeting shall (a) adopt a local Program for the ensuing year; (b) elect officers and directors, and members of the Nominating Committee; (c) adopt an adequate budget and (d) transact such other business as may properly come before it. Quorum. Ten percent (10%) of the voting membership shall constitute a quorum at all meetings of the LWVCNM. Nominating Committee. The Nominating Committee shall consist of five (5) members, two (2) of whom shall be members of the Board of Directors. The chairman and two members, who shall not be members of the LWVCNM Board, shall be elected at the LWVCNM Annual Meeting. Nominations for these offices shall be made by the current Nominating Committee. The other members shall be appointed by the Board of Directors immediately following the LWVCNM Annual Meeting. Any vacancy on the Nominating Committee shall be filled by the Board of Directors. Suggestions for nominations for officer and directors may be sent to this committee by any voting member. Report of Nominating Committee and Nominations from the Floor. The report of the Nominating Committee of its nominations for officers, directors and the members of the succeeding Nominating Committee shall be sent to all members one month prior to the date of the LWVCNM Annual Meeting. The report of the Nominating Committee shall be presented to the LWVCNM Annual Meeting. Immediately following the presentation of this report, nominations may be made from the floor by any voting member, provided the consent of the nominee has been secured. Election. A majority vote of those qualified to vote and voting shall constitute an election. Absentee or proxy voting shall not be permitted. Indemnification of Directors and Officers. The LWVCNM may indemnify each Director and Officer of the LWVCNM, and their heirs, legal representatives and assigns, against expenses, costs and attorney’s fees actually and reasonably incurred in connection with the defense of any action, suit or proceeding, civil or criminal, in which the Director or Officer is made a party by reason of having been an Officer or Director. The indemnification may include any amounts paid to satisfy a judgment or compromise or settle a claim. The Director or Officer will not be indemnified if adjudged to have been guilty of willful misconduct or recklessness in the performance of duty to the corporation. Advance indemnification may be allowed of a Director or Officer for expenses to be incurred in connection with the defense of the action, suit or proceeding, unless the Director or Officer was not entitled to indemnification by reason of willful misconduct or recklessness in the performance of duty to the LWVCNM. Authorization. The governmental principles adopted by the National LWVUS Convention constitute the principles for the adoption of the LWVCNM Program. Program. The Program of the LWVCNM shall consist of those local governmental issues chosen for concerted study and action. The Board of Directors shall consider the recommendations sent in by the voting members two (2) months prior to the LWVCNM Annual Meeting and shall formulate a Proposed Program. The Proposed Program shall be sent to all members one (1) month prior to the LWVCNM Annual Meeting. A majority vote of the voting members present and voting at the LWVCNM Annual Meeting shall be required for adoption of subjects in the Proposed Program as presented to the LWVCNM Annual Meeting by the Board of Directors. Recommendations for Program submitted by voting members two months prior to the LWVCNM Annual Meeting, but not recommended by the Board of Directors, may be adopted by the LWVCNM Annual Meeting, provided that (1) the members at the LWVCNM Annual Meeting shall order consideration by a majority vote, and (2) the members at the LWVCNM Annual Meeting shall adopt the item by a majority vote. In the case of altered conditions, changes in Program may be made so long as: (1) the Board of Directors provides information concerning the proposed changes to all LWVCNM members at least two weeks prior to a general membership meeting at which the change is to be discussed, and (2) final action by the LWVCNM members is taken at a succeeding general membership meeting. Member Action. Members may act in the name of the LWVCNM only when authorized to do so by the proper Board of Directors. LWVCNM Action. The LWVCNM may act only in conformity with, or not contrary to, the position taken by the LWVUS and of the LWVNM. National Convention, State Convention and Council. National LWVUS Convention. The Board of Directors, at a meeting before the date on which the names of delegates must be sent to the LWVUS Office, shall elect delegates and alternates to that convention in the number, if possible, allotted to the LWVCNM under the provisions of the of the LWVUS. State LWVNM Convention. The Board of Directors, at a meeting before the date on which the names of delegates must be sent to the LWVNM Office, shall select delegates and alternates to the convention in the number, if possible, allotted LWVCNM under the provisions of the Bylaws of the LWVNM. State LWVNM Council. The Board of Directors, at a meeting before the date on which the names of delegates must be sent to the LWVNM Office, shall select two delegates and alternates to the Council under the provisions of the Bylaws of the LWVNM. The rules contained in the current edition of Robert’s Rules of Order (Newly Revised) shall govern the LWVCNM in all cases to which they are applicable and not inconsistent with these Bylaws. These Bylaws may be amended by a two-thirds vote of the voting members present and voting at the LWVCNM Annual Meeting, provided the amendments were submitted to the membership in writing at least one (1) month in advance of the meeting.